St James church is an eye-catching attraction in the heart of the old city. However, a tour through Rothenburg reveals more churches with special stories. What? St James Church was finished in 1485 after 173 years of work. It began Catholic but later became Protestant and is today Rothenburg’s main church. As an alternative to the conventional guided tour, an audio guide is also available for exploring St James. Special highlights include the organ concerts held throughout the year. Fun fact: A statute of St James welcomes you in front of the church. Around 1000 pilgrims visit it each year with the visitant priest Oliver Gußmann. Be sure not to miss: St James church as TWO altars. The Twelve Heralds Altar by Friedrich Herlin is usually most visitors first destination. The main altar in the east choir features the oldest representation of Rothenburg’s marketplace. A prize jewel is the second altar in the west wing. The Altar of Sacred Blood is an excellent example of the work of Würzburg artist Tilman Riemenschneider. What? The Franciscan church was consecrated in 1309 and is today a Protestant church. Its interior houses the grave plates of Rothenburg’s patricians and their families, who used to live close to Herrngasse. Fun fact: The Franciscan church is still home to an original, wooden rood screen. Such rood screens used to separate the monks from the people. Be sure not to miss: In the Montessori garden next to the Franciscan church is an information board about Pope Francis. The Argentinian pope learned German in the Rothenburg at the former Goethe Institute during the eighties. What? 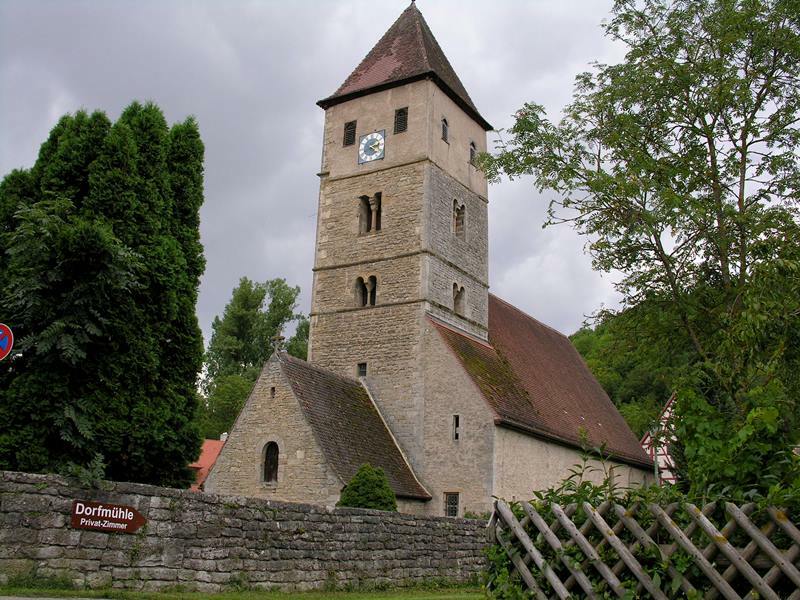 The St. Johannis church was originally a branch of the Order of Saint John around 1200. Around 1400 the church was redesigned in the Late Gothic style. Fun fact: Beginning in 1600, the church’s attic was converted into the largest city granary. An absolute must: One of the best views is found behind the church. In the road An der Eich, the view leads from a turret to far out over the vineyard towards Tauber valley and the castle gardens. Currently St Johannis is closed for visitors due to construction work on its facade. Late Gothic tracery and three altars from 1500. This is also the date that the church was built, on the exact spot where shepherds had for years sought protection for their herds with St. Wolfgang. 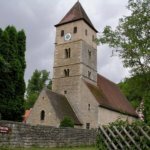 Fun fact: St. Wolfgang church is the home of the Historical Shepherd’s Dance Association, which has an exhibition on the importance of shepherding and the wool trade in Medieval Rothenburg. An absolute must: Up and down – both in the casemate as well as on the city wall in the church. This is an excellent way to get a close look at the city’s defenses. What? The Protestant Holy Spirit Church is situated in Rothenburg’s hospital quarter. The hospital developed from a charity around 1280 and was originally located outside the close city wall. The hospital cared for the sick and poor and it was a place where travelers who arrived after the south gate was closed could stay for the night. Fun fact: In 1308, the altar was consecrated by the Cistercian bishop Philipp from Eichstädt. An absolute must: The art-related highlight is the sacrament chest from 1390. The naked Christ child floats on a rainbow from the Divine to the Earthly world. Beneath it is an Annunciation scene depicting Mary with the angel Gabriel. What? Set off on a walk and stroll through the countryside to the beautiful town of Detwang in the Tauber valley! Around twenty minutes on foot from Rothenburg castle gardens you will reach St. Peter and Paul’s church with its Gothic arcades. Fun fact: This is probably where Rothenburg began. Detwang was first officially mentioned in 960. The church is over 1000 years old. An absolute must: Visit the Sacred Cross Altar attributed to Tilman Riemenschneider and his workshop. What? 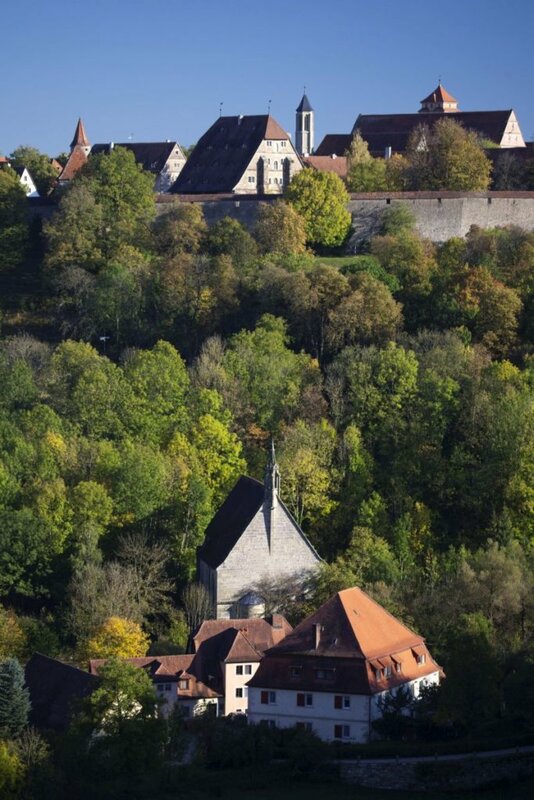 The small church at the Tauber River at the foot of the city was built between 1472 and 1505. It was plundered in 1525 during the peasant revolt and then minimally maintained without being used. It was sold in 1804 and deconsecrated. Fun fact: The Mary Church was restored by Alexander Heideloff from 1854 to 1860 and made available to the Catholic community. 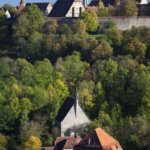 An absolute must: A short walk (about 10 minutes) from the city walls to the Medieval Crime and Justice Museum, through Rothenburg’s winery, and you will arrive at the idyllically located church on the banks of the Tauber River.